It’s a pooping tinkling Turkey, sitting on the pot, giving it all he’s got! New hysterically funny classic holiday bird decor, shows him resting on the potty, reading about eating more ham! 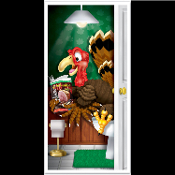 Hilarious bathroom door cover, featuring a traditional cartoon feathered friend on the toilet. Humorous Decorative Restroom Design is plastic, so can be wiped clean.